The thought of pipes freezing may seem a bit melodramatic, but it isn’t far-fetched. Water that freezes during the winter in an unprotected pipe expands, and that expansion can rupture. Taking preventative measures before the wicked winter weather hits, allows you to reduce and eliminate all cold-weather threats. And we all know how our St. Louis weather can be unpredictable, so it’s smart to be prepared. There are ways to prevent pipes from freezing, but due to location in the home, some pipes are more prone to freeze over others. Pipes that are against exterior walls have little or no insulation are subject to freezing. As your thermometer starts descending, make sure you pay close attention to the conditions of your pipes. Being prepared may help you avoid the messy and costly expenses that frozen pipes can bring. To that end Sams has a few suggestions on how to prevent water pipes from freezing and how to thaw them if they do. Inspection – While you’re putting away the pool water, check around your home for other areas where water supply lines may be located, particularly in unheated areas. Pipe insulation can happen in the basement, attic, garage, kitchen and unexpected spaces. You want to check for hot and cold pipes – the low temperature drops can affect all pipes. Installation – You may consider heating up your home different this holiday season when dealing with exposed water pipes. Go out and grab some heat tape, heat cable or similar materials that will provide significant protection in particular areas. It’s important that you keep your pipes warm in areas that don’t have frequent or prolonged temperatures below freezing. Prevention– During cold snaps (below 32 degrees) allow a faucet to drip slowly, moving water will keep the pipe from becoming blocked with ice and freezing. Also leave cabinets doors under sinks open to allow the warmer temperatures in your home to keep those pipes at a reasonable temperature. When disconnecting your water/garden hose, make sure to cover all the outside faucets. If you plan on being away for a while, shut off your water supply that connects to you washer. Lastly, close all windows, to keep burglars out and to prevent combined wind drafts and freezing temperatures from freezing your pipes faster. Application – Adding heat to a frozen pipe helps speeds up the process of melting the ice. Particular techniques such as wrapping a heating pad around a pipe, using an electric blow dryer or space heater makes for quicker results. Open faucets – To thaw a pipe, you can start near your faucet. In order to do this, you want to make sure your faucet is still on. Identify the frozen water supply pipe, and from there, you will be able to locate the blocked area. As you begin to treat the pipe, the water will help melt ice in the pipe as it passes by. Heat it up – Turn up the thermostat in your home for those pipes hiding behind the walls. Many people like to lower their thermostat when they’re out of town, but be sure to keep your house at around 60 degrees or higher to insure the pipes don’t freeze. As the pipe begins to thaw and water begins to flow from the faucet, allow the faucet to stay open for a few minutes. Make sure that all the ice is clear from the pipe. Once everything is all clear, cut off the faucet and check the line for leaks. From there, you will be able to decide if you need to replace or repair the pipe. The best solution for frozen pipe burst clean-up is to hire experienced and trained technicians. Water damage that seeps into the floors and drywall causes moisture that will rot the wood on walls and floors. At Sams, our water extraction and anti-microbial application techniques minimizes the prevention of mold and mildew problems. 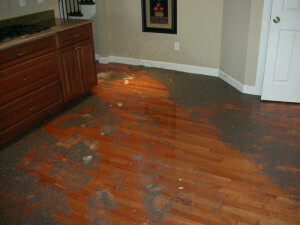 Our technicians know to restore areas of water damage from wet carpet, wet hardwood floors, walls, floods, etc. If you’re ready for a proper inspection and assessment, contact us today. If you experience a water disaster, don’t fear, we can help.